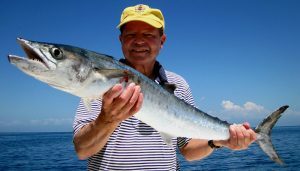 King mackerel or kingfish as they’re commonly called, are highly anticipated every spring and fall all along the St. Petersburg/Tampa Bay coast. Captain Wade Osborne is a live-bait specialist when it comes to kingfish. Osborne uses light tackle so his clients can fight the fish all the way to the leader not a planer. Every spring as the water temperature creeps toward 70 degrees, kingfish migrate northward with the baitfish on their annual trip to the Florida panhandle for the summer. The kingfish usually show up around St. Patrick’s Day in the spring and Columbus Day in the fall as they follow the baitfish southward back to the Florida Keys for the winter. Kingfish prefer water temperatures between 68 to 72 degrees. 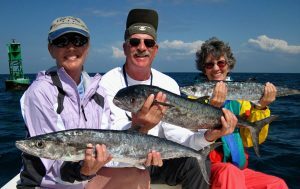 Local weather conditions have a lot to do with how long kingfish stay in the St. Petersburg/Tampa Bay area, but four to six weeks is normal. 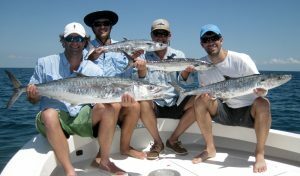 Kingfish charter fishing with Afishionado is a slow-troll, live-bait only affair. Live-bait attracts the largest fish and produces some of the most spectacular action. At times, it’s hard to set out more than two baits at a time because of all of the activity. 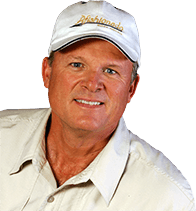 Once Osborne locates some kingfish, often no more than a few miles offshore, he lowers two baits on downriggers and puts two baits out on a flat line. Baits vary from Spanish sardines, cigar minnows, blue-runners, ladyfish and even Spanish mackerel. The “bigger bait, bigger fish” theory definitely works here. Shortly after deploying the baits, drag smoking action usually erupts as kingfish often chase the bait and skyrocket as they devour their prey. During The Spring and fall. Two per person, per day. 24 inch minimum to the fork of the tail.